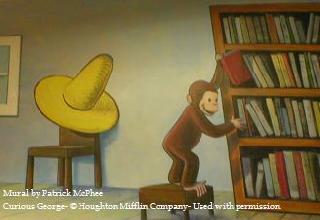 Come see the Curious George Mural in the Children's Area! Do you have a collection or an item to share with the people of Afton? If so, the Afton Free Library would like to hear from you. We are always looking for more items to show in our display case. If interested, please contact Ramona or Sean at 639-3312 during normal library hours. Our Summer Reading Program, "Catch the Reading Bug", will be held on Thursday afternoons during the month of July. Watch for further information. DROP OFF your Campbells product labels and General Mills Boxtops to the library. We are collecting these for the Afton Central School which will redeem them for funds to support their programs.